For those of you who read my posts regularly, this top may look familiar. I had a nasty run in with a bottle of bleach while I was wearing my beautiful Essential Denim Dress. I was left with a big streak across the top. That will teach me to do housework in my favourite clothes. Better to just leave it, I say. I have long loved this top (left) in all different shades of indigo by Stephan Alan, and recreating it in some way has been on my to do list for some time. I love the relaxed boxy fit and the boat neckline. The asymmetric pattern balances perfectly. 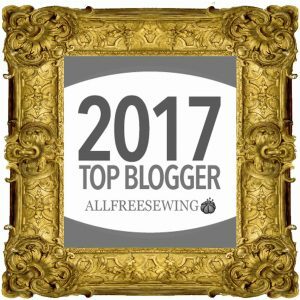 So here is my version – the Essential Denim Top – recycled from the original dress! 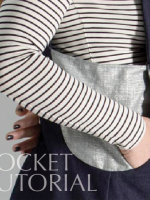 You can see how the pocket has become….well, another pocket really, just higher up. It is actually perfectly placed to looks like a dart which gives me a secret and quite geeky sewing thrill. The traditional denim-style orange stitching is still intact. 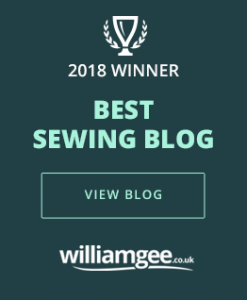 If you want to see how to get that perfect-spaced double line of stitching, read my post about sewing with denim. That double line is the secret to creating the authentic denim look. 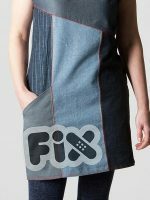 All the denims in the original dress come from Fabworks Mill Shop. They have a really good selection of denims and are now selling online (should you be tempted). I used my pattern for the 2 hour top (one of my free ones you can download from this site). 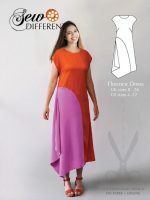 I laid the body part of the pattern out right at the bottom of the dress so that the existing bottom hem became the bottom hem of the new top. The original pattern has curved side vents, but I ignored these and just cut the body panels using the straight hem that was already there. The sleeves I then cut from various other bits of left overs. I did have a bit of the pinstripe denim left in my remnants box, so I used that as one of the sleeves, but I think any shade of blue would have worked. OR you could chose several different patterns that work using the same colour palette. For example all similar shades of green or blue. You could mix a floral with a geometric and a plain using this rule. OR you could go with similar pattern types such as all different stripes or different size polka dots. 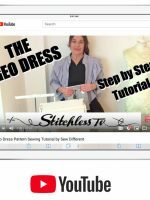 For more ideas and help about mixing your patterns then have a look at my post on the Asymmetric Dress which shows a whole series of examples of what and how to put things together. 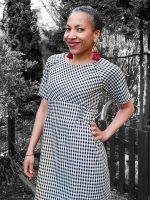 I also found another good post about pattern mixing from Tiny Side Kick which you might find helpful. I did also change the neckline somewhat. The original 2 hour top has a round neck but I fancied more of a boat neck for this one, like Steven Alan’s version. I just cut the neck wider with pointy corners, more like a slash in the fabric. Then edged it with some navy bias binding I had. I have to say, this shape of neckline usually comes in garments with shoulder seams which you don’t get with a raglan arm style like this. But never say I am one to be constrained by convention, I cut the wide neck anyway. It was a bit fiddly to do but the results look good. I think it was worth spending the time over. Here are a couple of tutorials about mitring corners of bias binding, should you decide on a wider neckline like this. I love the back as well. You can see from this shot here that it has an almost striped look due to the different colours of denim. I think it would look great teamed with a tiny floral print skirt – something really pretty to contrast with the utilitarian looking denim. It was a great project because so much of the work which makes it look really special, like the orange overstitching, was already done. It only took me an hour from start to finish. It felt like I got instant results and a ready-made top I know I will wear to death!